1.) No reproduction without written permission of the photographer and/or estate. 2.) No publication without the written permission of the photographer and/or estate. 3.) No distribution without the written permission of the photographer and/or estate. Any display, publication, or public use must credit the D.H. Ramsey Library, Special Collections, University of North Carolina at Asheville. 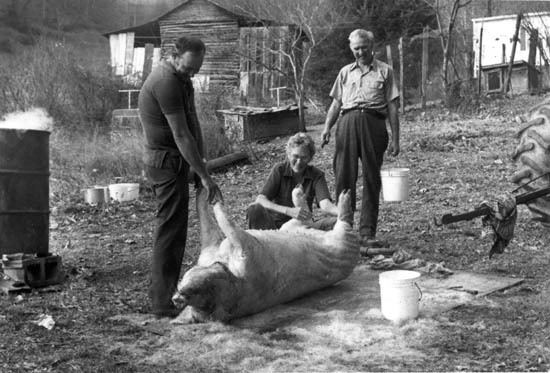 Description Two photographs depicting rural life in Madison County. 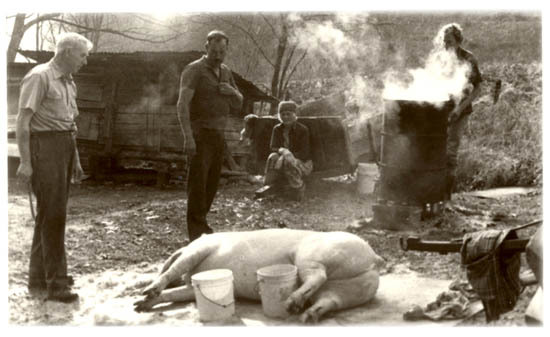 Hog killing is shown in both photographs. Processed by Special Collections staff, 1998 and 2001. "In the summer of 1994, I moved to an abandoned family owned cabin in Leicester, North Carolina. For the next several years, I photographed the surrounding area. While photographing, I began to notice the changes taking place in the community. Many local farmers began to rely heavily on migrant labor for the harvesting of their crops. Last June, a Mexican family moved into a trailer provided by a local farmer. They are the first family from Mexico to set up permanent residence on North Turkey Creek Road. People with different languages and cultures now inhabit the same space. Fredric Jameson called this new space 'postmodern hyperspace.' In hyperspace, there are no boundaries between nations or cultures. The comforting modern imagery of nation-states and national languages no longer exists. We are catapulted into a new kind of social space in which we struggle to locate ourselves. In order to understand where we are, and where we can go from here, we must develop new maps. The raw materials for these maps ought to lie in the details of people's daily lives. In an article titled Mexican Migration and the Social Space of Postmodernism, Roger Rouse addresses the issue of charting our way through a confusing present towards a future we can better understand. In our attempt to orient ourselves amidst the complexities of postmodern hyperspace, we should look not only to art and literature but also to the lives of those 'ordinary' people, said Rouse. Postmodern hyperspace is a photographic exploration of the changing social landscape in which we live. Thanks to all the people who allowed me a glimpse into their lives."